The Trust for Public Land's Fitness Zone® installations provide a fun, accessible, and social environment where people can enjoy getting fit. These clusters of outdoor gym equipment provide park visitors with a cardiovascular and resistance/weight bearing workout. The equipment is similar to what you might find in a private gym, but is more durable to resist weather and vandalism and appropriate for use by youth (age 13 and older) and adults of all fitness levels. Fitness Zone exercise areas increase access to exercise equipment and help address the nation's growing epidemic of obesity and related health problems. Obesity is the number one preventable cause of death in America. One in four Floridians are classified as obese and at risk from heart disease, diabetes, arthritis, and depression. 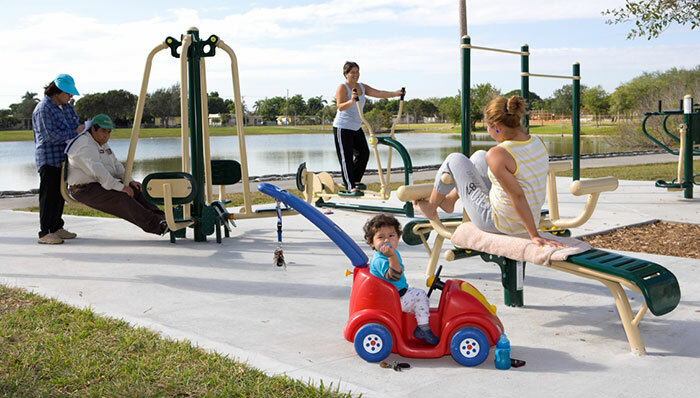 In July 2012, we opened our first Miami Fitness Zone installation at West Perrine Park. We will continue our partnership with the Miami-Dade Parks and Recreation Department to build new installations in Oak Grove Park, Leisure Lakes Park, and Martin Luther King Park.